"I recently ended a 7 year marriage and decided to read your book, How to Really Love the One You're With. Your book reinforced my feelings about the commitment and effort that are necessary to make a marriage work. It also reinforced the effort that I made to make my marriage work and that my decision to leave was the right one. Your book was very insightful and helped me to understand that when two people commit to giving 100% of themselves, their marriage can be uplifting and has a good chance of working. As you have suggested in your book, I will follow up with Bruce Fisher's book, "Rebuilding When Your Relationship Ends." Thanks so much for sharing your experiences, wisdom and insight. I greatly enjoyed your book." - Frank D.
"How to Really Love the One You're With" is a book for solo singles, singles with partners and married couples! The one you're with is the one you see in the mirror every morning! If you are a couple, the one you're with is you and your partner! "How to Really Love the One You're With" was listed as #3 on the "TOP 5 Non-Fiction Romance" books on Addicted-to-Romance.com on June 2, 2000. 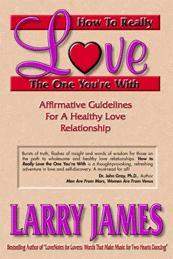 Larry's other books, "Red Hot LoveNotes for Lovers" and "LoveNotes for Lovers" were listed as #2 and #4.